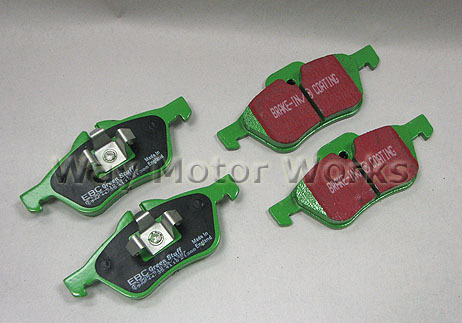 EBC Greenstuff brake pads for 2002-2006 R50,R52,R53 MINI Cooper and Cooper S offer improved performance over stock pads, including noise resistance and low dust. These are a great upgrade for anyone replacing pads even if you are not racing your car. Excellent for Autocross or light track use. Much better then some of the other pads we have tried. Peddle still feels a bit soft but getting used to it. Stock pads still have better initial bite and peddle. Less dust than stock and lower price. Did the install myself and pleased with the results. Fast shipping. Thanks Way! Green stuff pads work really well but they are as dirty or dirtier than OEM pads. Wheels are black after only a few hundred miles.